Provide young people with the information they need to research the many career options available, the training and skills that are required and each individual career’s economic prospects. We formed YPNG to help with career planning because making a good career choice is one of the most important decisions a young person will ever make. This choice determines how someone will spend the majority of their time throughout their adult life as well as their ability to support themselves and their family. This decision should not only be a good economic one, but also one that allows a person to develop their talents. Yet many young people do not have the resources they need to identify the many career opportunities that are available and their economic prospects. As a result, it is not uncommon to find them graduating with expensive degrees, a lot of tuition debt but unable to find good jobs or discovering once they are in a job that it is something they really do not like. This same thing happens to young people who have gone to technical schools to learn a trade. YPNG wants to help change this by giving young people the information to help them make both a fulfilling career choice and one that will prove to be a worthwhile investment of their time and money by providing the information they need to create and then navigate their own career path. Because the economy is always changing, the way people must prepare for a career has to reflect changing economic realities. In todays highly competitive economy, research and planning are critical to establishing a successful career path. Poor planning by a lot of young people regarding the demand for some careers results in bad choices particularly regarding college majors. 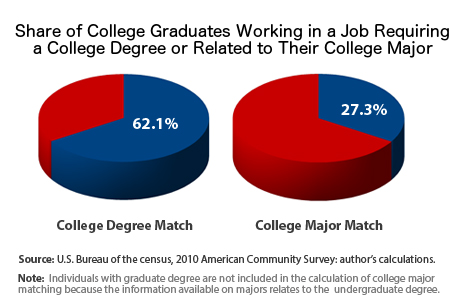 Because of this lack of through preparation, less than a third of recent college graduates were working in a field related to their college major and only about 60% of college graduates were working in jobs that required a college degree at all. More than half of all college graduates under the age of 25 were either unemployed or consider themselves underemployed. They have not been able to follow the career they thought they were preparing for when they invested their time and money getting their college degree or attending technical schools. Plus most of these young people are burdened with student loans that are now averaging just under $30,000 for college graduates. These loans are difficult to pay back if you cannot work in your chosen field. Furthermore, while about 65% of recent high school graduates now attend some form of college, only a little over 30% of those graduating from high school actually get a four year degree. Now consider that almost 40% of those graduates with degrees are underemployed or unemployed, it means that only about 20% of all high school graduates get college degrees where they end up being employed in jobs that actually require college. This disappointing result shows that many young people are not preparing well for college because less than half of them finish and those who do finish find out too late that they have made poor choices in establishing a major or choosing a particular educational institution to attend where there is little value to their degree. We have also seen this happen with people who have gone to school for technical training and were unable to find jobs after completing their course work. This does not mean that a college education or advanced technical training is not valuable. Unemployment rates are lower for college graduates, even considering those college graduates who are underemployed. Sources: October School Enrollment Supplement, Current Population Survey, Bureau of Labor Statistics; Thomas Luke Spreen. The statistics also show that on the whole, earnings are higher for those people with higher levels of education including technical training compared to high school graduates. SOURCE: U.S. Department of Education, National Center for Education Statistics. (2014). The Condition of Education 2014 (NCES 2014-083), Annual Earnings of Young Adults. But the earning chart does not address the fact that as tuition costs for all forms of advanced education have increased, so have the number of people taking out student loans as well as the average size of those loans. Consequently, salary levels by themselves do not give young people a complete picture of the return they will actually receive on the investment of their time and money. YPNG want to help provide young people with the information they need to have the ability to determine the value of any kind of post high school education before starting on a career path whether it is college, technical school or an apprenticeship. The underemployed young people in the studies we have cited were ambitious and obtained their degrees or technical training. In talking with them, many told us they had made a poor decision when they chose their major or chose a school and earned a degree that was not particularly valuable when they went to find a job. Many were also concerned about being able to pay back their student loans. All who said they made poor choices told us it was because they did not have the information they needed to make a truly informed decision. If they had only known more about the career they chose and better understood their job prospects, they would have spent their time and money differently. We also have seen that there are many career options that not enough young people are aware of because of either where they live, their economic background, limited career counseling resources in their high schools or their inability to access information about the growing variety of new careers that present themselves in our dynamic and rapidly changing economy. As a result, they end up entering fields without having a good understanding about the economic prospects for the careers they are pursuing when they get out of high school. As an example, about half of the unemployed college graduates in this recent survey said they would have done better with a different major and 16% with a different school. One of the ways YPNG can help a young person plan their career path is by giving them access to mentors from all walks of life so that they can see that there are many career options for them to consider. Mentors are people who have been successful in their own careers and can tell young people what abilities and personal attributes they must have to also be successful in their field based on their own personal experiences. They can also point out the best educational paths as well as give young people a realistic idea of what working in that career is like. Mentors are important. The majority of successful people have had someone who has guided them when they were first choosing and later beginning a career. YPNG want to use the power of the internet to allow mentors to be able to share their experience with many young people rather than just a few. Each mentor article will give our members access to information from people working in that career every day who can tell someone what it takes to be successful if they want to pursue that particular career path. We want people to become YPNG mentors who have been successful in a broad variety of career categories. Please remember that the amount of money someone makes does not define success or make one career better than another. To paraphrase Steve Jobs, the point to life is not to become the richest person in the cemetery. A well-lived life is one where you are able to do something you enjoy that also allows you to provide for yourself and your family. By that definition, anyone who is productive and a contributor to our society is a successful person and someone a young person will be interested in hearing from. The statistics prove that as a society we need to provide more effective career guidance to the 80% of high school graduates who do not graduate from college or end up working in careers that do not require college once they have graduated. We also need to be giving them better direction regarding their prospects if they enroll in any number of technical training programs. We all need to work towards making our overall advanced education system more efficient by trying to point out the career areas with the best future prospects and what personal traits are required to be successful in particular careers. On our Become a Mentor page, we ask you as Mentors to share with young people things like what your career involves, the kinds of personal skills you feel are required, the training needed to pursue your career as well as what you see future prospects for growth. There is also a link at the bottom of the page with a number of other suggestions for writing a mentor article. An hour or two of your time writing a Mentor Article can have a large impact on the lives of many people. YPNG will also provide young people a reading list of articles from magazines and newspapers as well as books and other recommended reading to help them make a better assessment of the career paths they are researching and what it takes to reach their goal. YPNG members will also benefit from their personal membership site. On that site they can post their interests, sign up to follow particular mentors and dialog with other members about their ideas and experiences. Once you are registered you will be also be able to comment on articles and submit articles for posting on our Blog. You can help us grow YPNG by encouraging people you would like to hear from participate as mentors. We want to include successful people from all walks of life in YPNG’s career categories and encourage everyone to participate including people in careers that may not be highly visible or well known. This is your site made up of people who want to help young people succeed. Give us your thoughts as both Mentors and Members on what information is the most helpful and meaningful to young people so we can continue to build and improve YPNG.